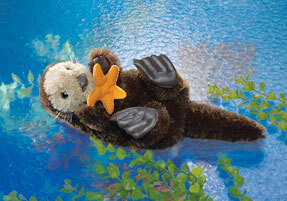 FACTS OF INTEREST: Sea otters are found in kelp beds along the North Pacific coast in several local colonies. Adult otters are four feet long and weigh 80 pounds. They must eat one- quarter of their body weight per day to survive. Sea otters are one of the few tool-using mammals: they pound open shellfish, sea urchins and crabs on a rock held on their chest. Sea otters were so heavily hunted for their beautiful fur that they were thought to be extinct. With protection, they have made a partial comeback.